It was over 80 degrees here in SoCal today in the middle of winter. I’m curious as to what spring will hold. In my classroom we will be discussing the role plants play in our lives and what they need to survive. Regardless of what the weather holds, these sunflowers really make my classroom feel spring-like. Not only do we make these sunflowers to pay attention to all of the plant parts, but we also label each part with information about the job they have. Those are real sunflower seeds glued to the center of the flower. This resource contains all of the black lines to create this sunflower. All you need to do is run each part on its corresponding color of construction paper. I recently updated this resource with a more detailed writing lesson. It now includes a detailed lesson that can be used with a variety of levels of writers. I’ve included three different writing plan graphic organizers to suit the needs of K-3 writers. I like to incorporate science and social studies into our ELA lessons as often as possible. 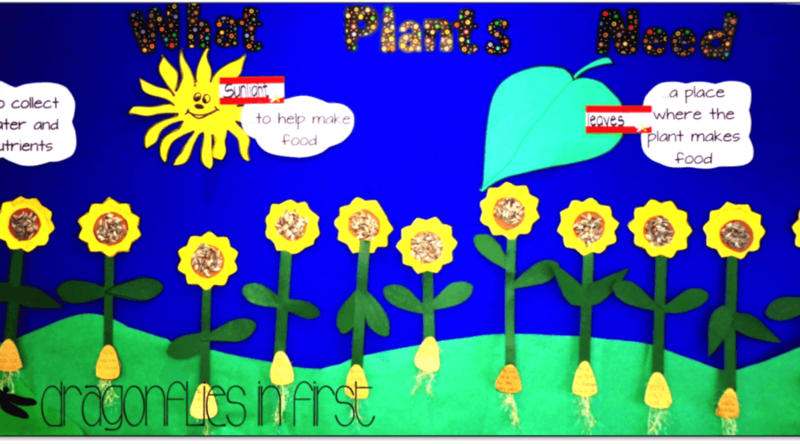 Throughout March, much of what we work on during ELA will have to do with the science of plants. This cute little reader is part of this resource. Since we will be discussing plants throughout the month, I will have these vocabulary cards up on my focus wall. This resource was my first top seller. I love that its a favorite of so many teachers. I thought it deserved a little facelift. If you already own it, please re-download this revised version. Click the cover image to check it out. What are you studying when spring comes our way?